One of the most egregious lies from Joseph Smith has to be his false claim that Jesus’ atonement for man’s sin took place in the Garden of Gethsemane. 1.Mormons don’t believe Jesus is God. 2.Jesus didn’t pay for sins in the Garden of Gethsemane. 3.Smith made Jesus out to be a weak man in his description of supposed events in Gethsemane. 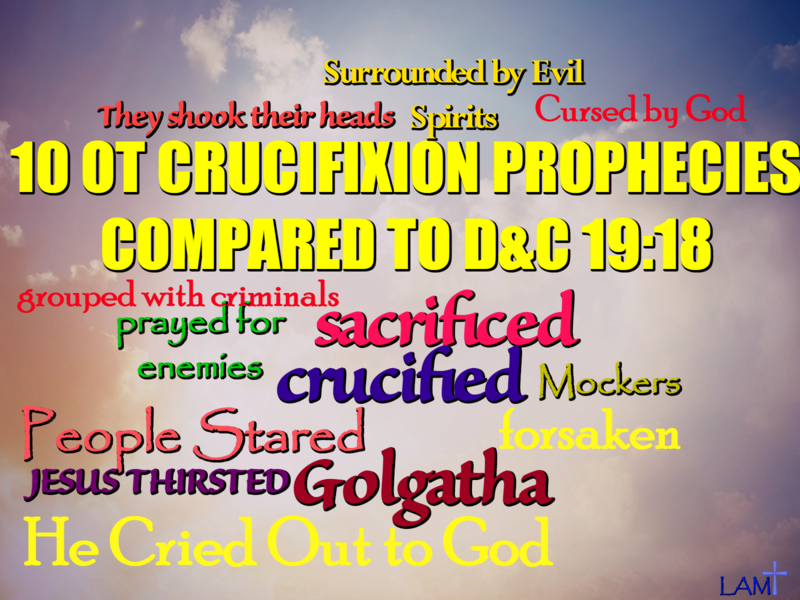 There are 30 OT prophecies and/or foreshadowing events of Jesus’ payment for man’s sin on the cross. We can read how each of them were foretold and fulfilled in the Bible. For the sake of time and space, today we’re looking at just 10 of those awesome prophecies. Please, do share these and other fulfilled promises of God with the Mormon you know! Psalm 22:17bThey look and stare upon me. Luke 23:35aAnd the people stood beholding. Isaiah 53:12cAnd he was numbered with the transgressors. Luke 22:37bFor I say unto you,that this that is written must yet be accomplished in me, And he was reckoned among the transgressors: for the things concerning me have an end. Genesis 22:14 And Abraham called the name of that place Jehovah-jireh. Luke 23:33And when they were come to the place, which is called Calvary, there they crucified him. Psalm 22:7All they that see me laugh me to scorn: They shoot out the lip, they shake the head. Matthew 27:39And they that passed by reviled him, wagging their heads. Psalm 22:8He trusted on the Lord that he would deliver him: Let him deliver him, seeing he delighted in hi Matthew 27:43He trusted in God; let him deliver him now, if he will have him: for he said, I am the Son of God. Psalm 22:1My God, my God, why hast thou forsaken me? Matthew 27:46And about the ninth hour Jesus cried with a loud voice, saying, Eli, Eli, lama sabachthani? that is to say, My God, my God, why hast thou forsaken me? Psalm 38:11bAnd my kinsmen stand afar off Mark 15:40There were also women looking on afar off: among whom was Mary Magdalene, and Mary the mother of James the less and of Joses, and Salome. Psalm 109:4For my love they are my adversaries: But I give myself unto prayer Luke 23:34aThen said Jesus, Father, forgive them; for they know not what they do.